As an avid learner and teacher, it should come as no surprise that I am fascinated with the brain. I’ve sketched and written about the brain before, but in this post I’m focusing on the distinction between two parts of the brain – one that is the center of emotions, the other that is the center of rational thought. 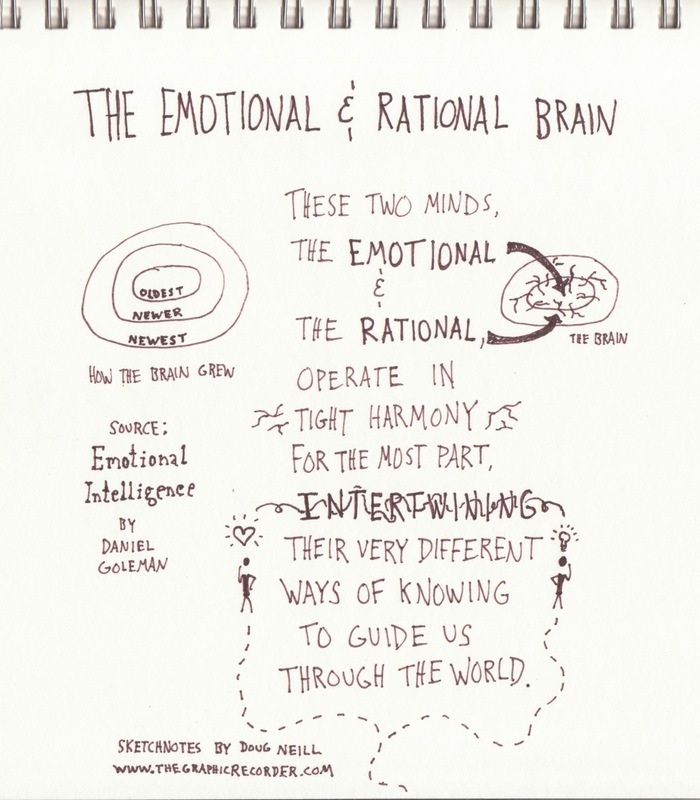 I just started reading Daniel Goleman’s Emotional Intelligence, and I was happy to find that the science-based first chapter is rooted in the structure of the brain and the process of evolution that resulted in that structure. The sketchnotes above capture some of the ideas from the first chapter of that book, which I will discuss in this post. My interest in the brain is both personal and practical. I want to better understand my own brain and use that understanding to navigate the complex world around me and lead a more fruitful life. I also want to understand my students at a deeper level so that I can better meet their emotional and intellectual needs in the classroom. It is through those dual lenses that I approach my study of the brain. The first big idea from this chapter is that the brain evolved in such a way that the inner parts of the brain are evolutionarily older than the outer parts. As our brain grew and evolved throughout many generations, newer sections developed on top of older sections. This means that the deeper you delve into the brain, the older the components. This also means that the part of our brain that makes us human – the fully developed neocortex – was the last to develop and therefore is located in the outer section of the brain. Just inside the neocortex is the emotional center of the brain – which developed earlier in our evolution. This means that emotions have been around longer than rational thought. The second big idea is that the emotional section of the brain and the rational section are not isolated, but deeply connected. These two sections of the brain are wired together to communicate with each other to provide for us a more complete view of our surroundings and help us make decisions. The implications of this fact is very important. We cannot divorce emotions from our rational thoughts. Similarly, our rational thoughts can influence our emotions. This gives us both a certain amount of control over our emotions as well as a certain amount of lack of control of our rational thoughts. The intertwining of the emotional and rational components of the brain means that as educators we must pay attention to the emotional state of our students because their emotional state greatly affects how their rational brains react to new information. This does not mean that we do everything in our power to make students happy. What it does mean is that we need to engage our students emotionally. We can use a variety of emotions – not just one. Once our students are emotionally engaged we can use that engagement as a springboard to deep learning. Through emotional engagement we can help students develop the rational part of the brain so that they can fully utilize both parts when they leave our classrooms. As I sketched out those abstract representations of the brain that you see in the image above, a question came to mind: As the brain of an individual develops throughout their childhood and adolescence, does the emotional center develop completely and then the rational center? Or do the two sections develop simultaneously? That seems like an important question, and I’m not sure that I would have asked it had I not taken the time to sketch these ideas out.